DURBAN, South Africa, December 6, 2011 (ENS) – As the high-level portion of the UN climate negotiations in Durban opened today, a legally binding climate treaty is once again on the table after being sidelined for years by disagreements between developed and developing countries. The conference brings together representatives of the world’s 195 governments, international organizations and civil society groups. They cover implementation of the UN Framework Convention on Climate Change and its Kyoto Protocol, a commitment by 37 developed countries, most in Europe, to reduce greenhouse gas emissions an average of five percent by the end of 2012. The European Union continued to seek support for their proposal on a roadmap for a legally-binding agreement. Connie Hedegaard, European Commissioner for Climate Action, urged action as she addressed delegates at the opening of the high-level session today. “Europe is ready to decide and deliver. Our legislation is built on Kyoto principles. We will over-achieve on our Kyoto commitment. We have a 20 percent target for 2020. And we are ready to go to 30 percent, provided others are also ambitious. 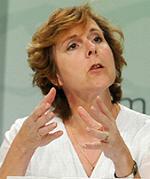 But Europe only accounts for 11 percent of global emissions,” she said. 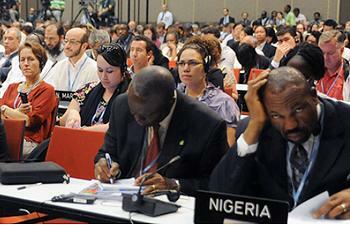 “The Convention and the Kyoto Protocol continue to be the foundation of our international regime. However, they were both crafted in the 20th century. A future regime needs to reflect the reality of the new century, and the reality is that the countries that were industrialised countries back in 1992 account for a rapidly decreasing share of emissions. Therefore, in order to tackle effectively the challenge in the 21st century all major economies need to commit. “China has really expressed its stance on many negotiating occasions and as I said just now, very clearly, we accept a legally binding arrangement, with conditions. China is willing to bear the obligations of a legally binding commitment matched with China’s economic development and capabilities based on the principle of common but differentiated responsibilities, fair and environmental integrity,” Xie said. Brazil, South Africa, India and China, known as the BASIC countries, are united and demand that a second commitment period for the Kyoto Protocol “is a must,” Xie told a joint news briefing with his South African, Indian and Brazilian counterparts. “The BASIC countries are united firmly. We are countries of action. 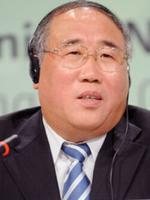 We are ready to do our due contributions on climate change to advance the Durban conference,” Xie said. 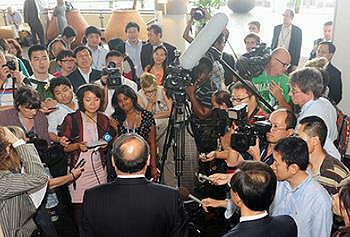 Top U.S. negotiator Todd Stern told reporters today that the Chinese position is nothing new. “It’s not my impression that there has been any change at all in the Chinese position with respect to a legally binding agreement, and I didn’t understand Minister Xie to be contending that there’s been any change in the position,” Stern said after meeting today with the Chinese delegation. The issue of whether or not the legally binding Kyoto Protocol will continue after its first commitment period expires at the end of 2012 is central to the Durban talks. Neither United States nor China are participants, and Canada, Japan and Russia have said they will not participate in a second commitment period. “Let’s assume, as I said, that Kyoto goes forward in some fashion in Durban, it is likely to cover somewhere in the vicinity of 15 percent of global emissions,” said Stern. Stern said these pledges were made under a legally binding treaty, UN Framework Convention on Climate Change. “They are serious submissions that I think all the countries who made them intend to carry them out,” Stern told reporters today. Financing for climate change adaptation and mitigation in developing countries is a crucial key to the next global climate protection regime. This financing is taking two forms, a US$30 billion fast-start fund covering the three years 2010-2012 and the annual US$100 billion Green Climate Fund agreed in principle at last year’s climate talks in Cancun. 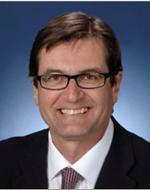 Greg Combet, Australian minister for climate change and energy efficiency, told delegates today the developed countries are fulfilling their commitment to the fast-start fund, as promised. A significant proportion of this is going to help Africa climate-proof its agriculture, manage its water resources and boost its food security, said Combet. 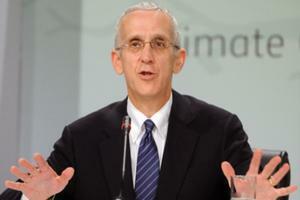 The Green Climate Fund is also on track, said U.S. negotiator Stern. Although the U.S. has objected to several points in the Green Climate document on the table in Durban, Stern said he is “pretty optimistic” that the fund will be approved in Durban.